CK Eternity Purple Orchid captures true love in bloom and unconquered passion. CK Eternity Purple Orchid 100ml. EDP is a luxurious floral fragrance that perfectly accentuates your softness and fragility. Perfume Eternity Purple Orchid captures true love in bloom and unconquered passion. Calvin Klein Eternity Purple Orchid fragrance bearers are romantic, sensitive and sensual women who are not afraid to show their feelings. They listen to the voice of their heart and are very intuitive. Charming and aromatic floral chords resemble the scent of the spring garden that awakens to life. Sweet fruit notes stroke all your senses. Captivating woody tones open your heart to passion. Fall in love with the feeling of joy from simple being and let yourself bring in pleasant moments of tenderness, purity and beauty. This exclusive Calvin Klein perfume is great for a romantic date. Calvin Klein Eternity Purple Orchid is a classical yet contemporary lady fragrance that perfectly reflects the modern lifestyle of today's romantic woman. 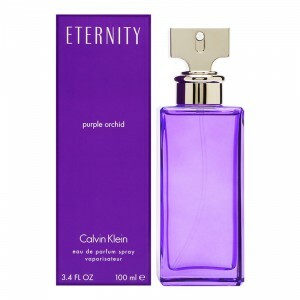 Peeling and exciting perfumed water Calvin Klein Eternity Purple Orchid will become a real feminine revelation, delight and punishment at the same time for the men who are killed on the spot. In the "heart" of perfume, the sensual orchid reigns supreme, enhanced by a juicy environment of plum, white freesia and heliotrope. White peach adds a special thrill and eroticism, and the water lily tempts with a delicate smell of vice and innocence. Perfume bouquet absorbed the most delicate and juicy floral, green and fruity notes, so that the man did not have a single chance! Wood shades, almonds and citrus create a special provocative palette, where freshness borders on tartness, and earthiness - with a sexual attraction. This fragrance is created for courageous women, who do not recognize obstacles in love, in thoughts, or in desires!